A layered Chocolate Cake never goes out of style. Trends may come and go but a Chocolate Cake is as popular today as it was 10, 20, or 75 years ago. This Simple Chocolate Cake is especially appealing both for the baker and for those who get to enjoy this cake. I find that most bakers are always on the lookout for a cake recipe that can be made really quickly yet doesn't sacrifice texture and flavor. This Simple Chocolate Cake recipe is just that. The batter can be made, and the cakes in the oven, within 15 minutes. 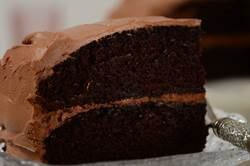 Yet, it produces a cake with great chocolate flavor a deliciously soft and moist texture. While you could frost this cake with any flavor of frosting, my favorite is this buttery smooth chocolate fudge frosting. Because I find there is nothing better than a double dose of chocolate to make everyone feel better. This is my "go to" Chocolate Cake. I make it for family dinners, birthdays, and everything in between. I really like the combination of two types of chocolate. Unsweetened cocoa powder is used in the chocolate cake and a dark chocolate (semi sweet or bittersweet) is used in the frosting. For the cocoa powder you can use natural unsweetened cocoa powder or Dutch-processed (alkalized). Just remember that both the type and brand of unsweetened cocoa powder will affect both the taste and color of your chocolate cake. One of the reasons for the cake's soft and tender texture is that the fat is in liquid form (flavorless oil). The added benefit of using oil, instead of butter, is that it keeps the cake soft even when refrigerated. As far as the type of oil to use, good choices are vegetable, canola, corn, safflower, or even a light olive oil. Simple Chocolate Cake: Preheat oven to 350 degrees F (180 degrees C) and place oven rack in the center of the oven. Butter, or spray with a non stick vegetable spray, two - 9 inch (23 cm) cake pans. Then line the bottoms of the pans with parchment paper. In another large bowl, whisk together the eggs, water (or coffee), milk, oil, and vanilla extract. Add the wet ingredients to the dry ingredients and stir, or whisk, until combined. (The batter will be quite thin.) Evenly divide the batter between the two pans and bake for about 27 - 32 minutes or until a toothpick inserted into the center of the cake just comes out clean. Remove from oven and let cool on a wire rack for about 10 minutes. Then remove the cakes from their pans and cool completely on a greased wire rack before frosting.